When a friend approached me about doing her Christmas card I was thrilled! Although we sat for a while and talked before getting down to work, when we finally started flipping through all the books there was nothing that caught her eye. She came prepared with the pictures she wanted to use, and had an idea of what she wanted it to look like. As always, I turned to Jill at Copper Willow and we designed a custom card! The pictures were taken from a family vacation and we felt that all three photographs needed to be used because they were SO great! We did a few rounds of proofs to get this card to look amazing! We tried printing the photographs on two types of paper. One being a cotton piece of paper, the other photo paper. The quality of the images was so much better on the photo paper and it really picked up the blue water, so we decided to go with that one. 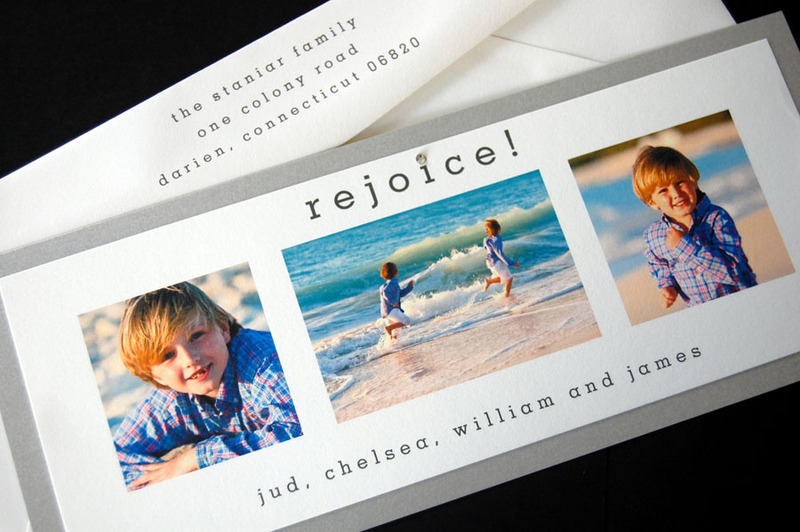 We printed on the photo paper and then to add weight to the card we backed it with a silver piece of cardstock. The silver played well back to the grey ink that we used for the text of the card. I love Silver around the Holidays and it worked very well on this card! 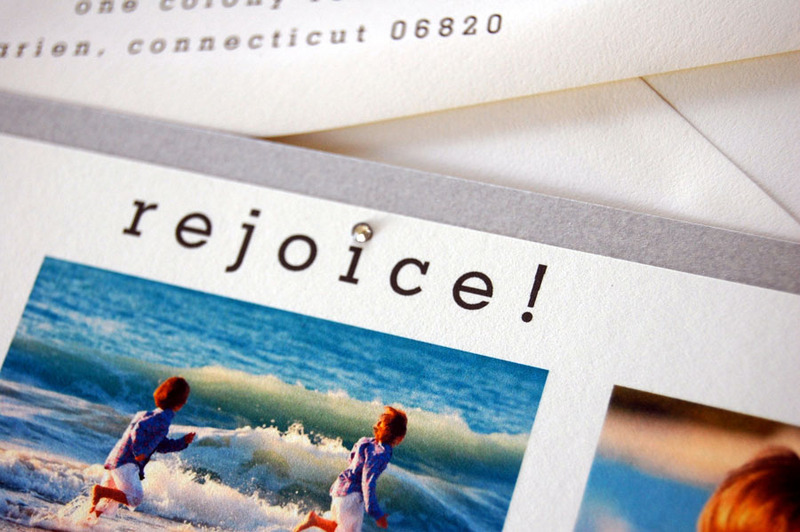 The final touch on the card was to put a crystal embellishment above the ‘i’ in rejoice! Jill used a diamond Swarovski crystal and it made the card simply perfect! I loved how it turned out and so did the family! Can’t wait to do their next custom card next year … I’ll have to start thinking of new ideas now!